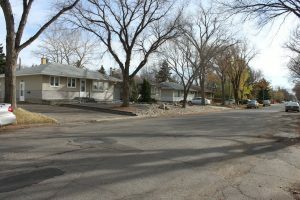 The Churchill Downs neighborhood is in the North end of Regina and backs the Cityview neighbourhood and Highland Park neighborhood to the West, the Uplands neighborhood to the North, the Ross Industrial neighbourhood to the East (over the Ring road) and the Warehouse District and Eastview neighborhoods to the South. Construction started ramping up in Churchill Downs in the 50’s and 60’s in the Northwest section of this roughly triangularly shaped neighbourhood. This section is almost exclusively residential with a sprinkling of businesses located on the high traffic arteries. There are a few mature parks in this area with play structures, ball diamonds and a basketball court as well as the Usher soccer field. Regina’s only Francophone High school is also located here. A unique and historic feature of Churchill Downs are the handful of huge special “Veterans Lots” some being as much as 25,000 square feet! Local businesses patronized here include Trifon’s Pizza, Unique Florists, Bruce’s Landscape Supply, Vietnamese Garden, and the Vintage Tea Room and Purveyor of British Goods. The south portion of the Churchill Downs neighbourhood over the tracks has several sprawling automotive dealerships including Mercedes-Benz Regina, and the Taylor Automotive Group. There is also a large utility area tucked away here dedicated to City of Regina Storage & Maintenance facilities. The northeast section which edges up against the Ring Road is similar to the Ross Industrial neighbourhood just to the Northeast. Containing a large assortment of businesses with more spacious needs, it is considered a primarily commercial and light industrial area. Long time and local operations you’ll find here include The Regina Food Bank, Global Regina TV studios, Saskatchewan Hockey Association, and the nearly famous Cowtown & MasterFeeds. The Regina Floral Conservatory is an outstanding neighbourhood feature in Churchill Downs enjoyed year-round by Regina residents and visitors alike. The conservatory is absolutely stunning to see and is open for public tours and can also be booked for weddings and other private social events.